The Arsenal VB 10 was a French fighter aircraft developed during and shortly after World War II. 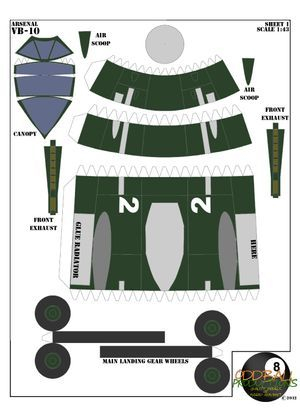 It was a low-wing monoplanewith retractable tailwheel undercarriage and of largely orthodox configuration. The ultimate product of a design that began with the Arsenal VG 10 prior to the war, the VB 10 added a second engine behind the cockpit which drove a second propeller, coaxial with and contra-rotating to the propeller driven by the engine in the nose. 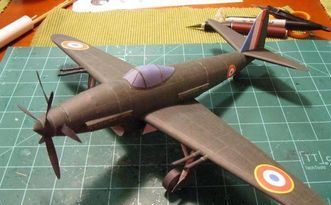 Although the aircraft was first designed (and indeed ordered) in 1940, little progress was made during France's occupation, and the prototype did not fly until after VE day. By then, it was already apparent that the future of the fighter lay with jet power, but development of the VB 10 continued as a safety net for France's nascent jet fighter programmes. In December 1945, a contract for 200 machines was placed by the French government, the first of which flew on 3 November 1947. By the time the fourth had been delivered in September 1948, the entire order was cancelled, with the French Air Force relying on surplus British and American fighters to tide it over until domestically produced jet fighters appeared shortly thereafter.